Takeaway: Today we launched a Product Content Grader that measures content effectiveness and provides actionable recommendations for your brand's product sold on Amazon. You can get a detailed report about what’s up to par and what’s not on your product page across six key categories for free. Try it now! Your product content has the power to improve your visibility, increase conversion, boost your sales, and drive customer loyalty. Year after year we’ve heard from consumers how important product content is to their shopping journey and we’ve seen our customers grow their business based on updates and enrichment. But knowing that product content has the potential to improve your bottom line, isn’t the same as diagnosing which changes and enhancements to make to the product content you have today. 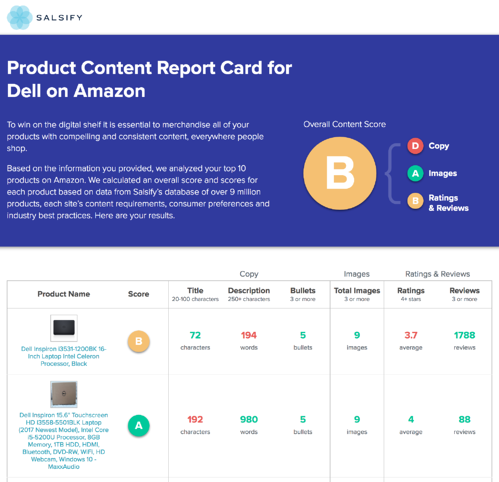 We built a free product content grader to help brands see what product content is up to par and how to make the most of the content you send to retail partners. Now marketing, ecommerce, and sales teams can get an instant view of whether the content on a product page is meeting consumer expectations. Enter a brand name for any product on Amazon. A report will be automatically generated and mailed to your email inbox. Based on the brand you submit, Salsify automatically scores ten of your top products across 6 categories that impact shopper purchase decisions. The product pages are scored using a machine learning based system that encompasses industry best practices, consumer shopping research, and insights from Salsify’s database of over 9 million products. With this report, you can then share the strength of your content to the stakeholders in your organization and/or start making improvements right away to your Amazon pages. What are the elements of a good product page? From our consumer research, we know that shoppers rely on product content to make purchasing decisions. We took a closer look at how the best performing pages were using product titles, product descriptions, feature bullets, images, and ratings and reviews to generate an overall grade. We’ll be updating our product content grader with performance insights from additional retailers in the coming weeks, so stay tuned!